Once upon a time, posting free status updates on your Facebook page was a very viable way of reaching consumers. Regardless of the content of your post or the engagement your posts received, a steady stream of sales pitches could reach a business page’s fans. However, with increased saturation of posts as Facebook grew in popularity, the site’s administrators needed to find a way to stop businesses and brands from overloading their fan’s News Feeds with content. New rules and formulae for how Facebook decides whether a post shows up in users’ News Feeds have over time made it harder for the average “Check us out” or “Sale on today” sales pitch-type post to be seen. This will become true to an even higher degree in mid-January 2015, when Facebook will "intensify its efforts to filter out unpaid promotional material in user news feeds". In a modern marketing environment where “more than 80% of small companies using social media to promote their businesses list Facebook as their top marketing tool”, this is a big hit on the marketing visibility of small businesses. The same can be said about big businesses too, as a business of any size is likely to use Facebook as one of its main marketing channels. Luckily, TapSnap is here to help by providing businesses with branded content that will reach large audiences on social media. While businesses can pay for Facebook ads or to promote posts, this is not always the ideal solution as many businesses are looking to limit their expenses. Even for the most profitable businesses, TapSnap offers a cost-effective way of reaching large audiences on social media. In order to deal with these new visibility rules, businesses should seek to create content that their fans will engage with (like, comment on, or share). Rich media like images are especially good for engagement. TapSnap creates branded photos of event guests that they’ll be eager to share. 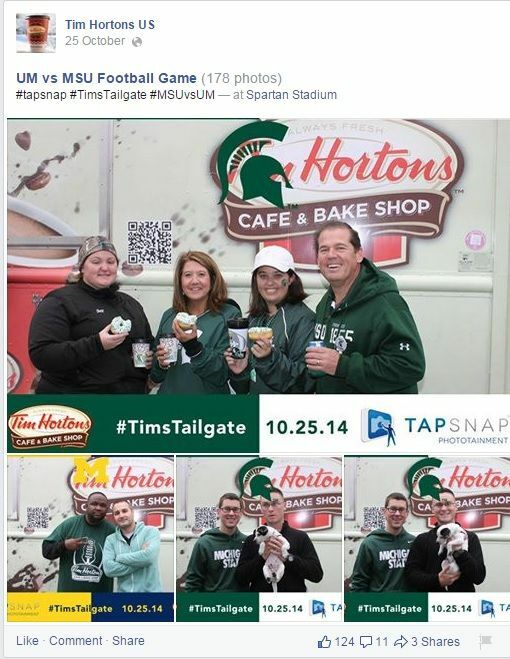 When an event-goer takes a photo with TapSnap then shares it on Facebook, their friends’ timelines are populated with the branded images. Guests love to share their photos because they’re fun, and people will check out the content and engage with it. It’s not selling, and consumers react differently when marketing content isn’t a direct sales pitch. So if you’re a business looking to maximize your Facebook visibility and to work around the site’s new rules, choose TapSnap as part of your social media marketing strategy.